The Eraser tool in Photoshop Elements 11 allows you to erase areas on your image. If the image contains just a background, you erase to the background color. 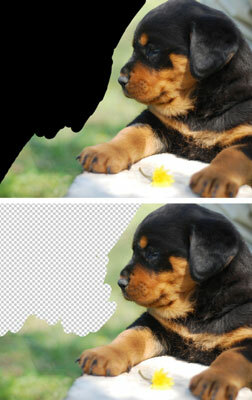 If the image is on a layer, you erase to transparency. To use this tool, simply select the image and then click and drag through your desired area on it, and you’re done. Because it isn’t the most accurate tool on the planet, remember to zoom way in and use smaller brush tips to erase accurately. Brush Presets Picker: Click the drop-down panel to access the Brush presets. Choose the brush you want. Again, additional brush libraries are available from the Brush panel menu. Size: Slide the Size slider and choose a brush size between 1 and 2500 pixels. Opacity: Specify a percentage of transparency for the erased areas. The lower the Opacity setting, the less it erases. This option isn’t available for Block mode. Type: Select from Brush, Pencil, and Block. When you select Brush or Pencil, you have access to the Brush Preset Picker panel in the Tool Options. When you select Block, you’re stuck with one size (a 16-x-16-pixel square tip). But because the block size remains constant, if you zoom way in, you can perform some detailed erasing.